On July 13, 1946, Robert W. Henderson, the chief librarian of the main reading room at the New York Public Library, received an amazing collection of baseball ephemera. The collection was donated to the library by Leopold Morse Goulston, who was a former vice president of the Boston Braves. Goulston donated the collection in memory of his friend, Leo J. Bondy, who had died 2 years earlier. Bondy was a baseball colleague of Goulston’s -- he was vice president and treasurer of the New York Giants. The collection Goulston donated included over 1,000 items related to pre-war baseball, including photographs, prints, rare cartoons, books, souvenirs, and, most interesting for baseball card collectors, a large collection of pre-war baseball cards. With Goulston’s permission, a few of the collection’s items were donated by the library to the Hall of Fame in Cooperstown, New York, including a trophy baseball from 1867 that had been presented to Goulston by the A.G. Spalding Company, as well as a “cheater’s bat” -- studded with nails and painted black -- dating from 1890. The library kept the baseball cards and pasted them into albums. While this appears at first blush to be an unfortunate effort to attempt preservation, the fact that the cards were pasted into albums is one of the secrets to the library’s ability to maintain the collection for the past 62 years. There is an extremely rare set of two hundred and fifty Old Judge cigarette photographs; a set of five hundred and fifty Sweet Caporal colored portraits; a set of large photographs issued by the ‘Sporting News’ in 1910-1911; and a number of cabinet photographs of players. The baseball card collection included plenty of “greatest hits” from the 1880s through the 1910s, including a huge assortment of T206 cards. However, somewhat fewer than 550 Sweet Caporal cards were included, even if one counts the T205 cards with Sweet Caporal backs (indeed, the library did just that, pasting the cards into the album by advertising back, commingling T205 and T206). Still, Goulston managed to acquire just over 450 different T206 cards. And, standing out among the impressive collection is Goulston’s Wagner. None of the other T206 cards in Goulston’s collection are as publicly visible, on-line or otherwise. One cannot simply walk into the library and ask for the big book of T206 cards containing the Wagner. An ordinary library card also does not provide access. Being able to view the collection rests in the sole discretion of the library, and access is granted only for approved research projects. 1. Individual portraits, Old Judge, etc.--2. Misc. photographs, prints, score cards, etc.--3. Individual portraits, Sporting news.--4. Individual portraits, Sporting news.--5. Mounted cigarette portraits.--6. Misc. prints, photographs, score cards.--7. Large prints.--8. Misc. prints, photos, souvenir cards, centennial.--9. Misc. cartoons, prints, group portraits and sheet music.--10. Season passes designed by Charles Dana Gibson, 1930-31. Given my bias toward T206 cards, I was most intrigued by “5. Mounted cigarette portraits.” And, in fact, the library refers to the album that holds Goulston’s T206 collection as “Goulston #5”. 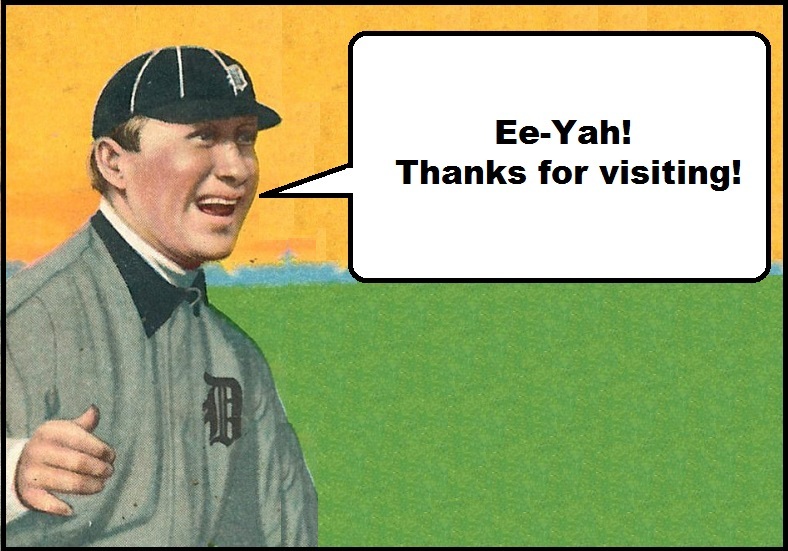 Using the chat feature, I asked an on-line librarian if it was possible to see the T206 collection. The librarian told me that the collection was located in Room 328 at the New York Public Library, 5th Avenue and 42nd street in New York City. I later learned that Room 328 is the Brooke Russell Astor Reading Room for Rare Books and Manuscripts. The librarian also gave me the e-mail address of the collection’s curator, Virginia Bartow. Ms. Bartow is the curator of the George Arents Collection, a portion of which is the Collection on Tobacco that appropriately contains Goulston’s tobacco baseball cards. I also learned that the collection was “open to the public with a few restrictions.” The restrictions primarily are designed to keep the public from stealing or otherwise harming the collection. As a result, visitors are required to check bags, keep valuables in clear plastic bags and are only permitted to write with pencils. So nice to hear from you at last. I've been actively using your site and referring readers to it since you began posting the list of T206 cards. I used it recently to verify the ballplayers’ names and teams for the cards currently on exhibit in the Edna Barnes Solomon Room. The item known here as Goulston #5 has a terrific collection of T206 cards, most with the Sweet Caporal back. Our copies are not in prime condition as they were pasted into an album soon after their receipt. No doubt that is why the Goulston Collection of baseball tobacco cards continues to remain intact. Ms. Bartow invited me to visit the collection, and I promptly scheduled an appointment. In order to enter the Reading Room, visitors must apply for two separate passes -- an ACCESS card and a Reading Room card. Once both are secured, visitors may be granted access, in the library’s sole discretion, to the otherwise locked Reading Room. The Reading Room is a dimly lit but beautiful room in the back of one of the large main public rooms on the library’s third floor. Elegantly decorated, the room features a majestic pink marble doorway containing bas-relief and an ornate white ceiling surrounding a large skylight that only permits a dull, artificial light to enter. The room is surrounded by two stories of glassed doors, through which one can see countless shelved books and manuscripts. A short decorative metal fence runs along the perimeter of the floor as well as the catwalk that permits access via two stairways at opposite ends of the room to the items behind the glass doors at the second level. Twenty-four tables with a single light fixture for every desk are set off to the side of the main area, which contains a standard librarian’s reference desk in the center. In my two visits to the collection, the album known as Goulston #5 was placed onto a table in front of me, in a holder that protects the spine while I was permitted to delicately leaf through the pages. The book has a blue nondescript cover and is the size of a very large scrapbook or photo album. I was permitted carefully to turn the pages ­­-- more than once, I was told to slow down my browsing -- and I was instructed to refrain from touching the cards pasted on the paper. The first baseball cards that appear in the book are Goulston’s Old Judges. In fact, the first 30 pages of the book are Old Judge cards from 1887-1890 pasted on one side of each page. Next were three pages containing Goulston’s modest collection of Mayo’s Cut Plugs from 1895. The remaining pages were dedicated to early 20th Century issues. A sample of T205 cards, sorted by Hassan and Honest Long Cut reverses, was followed by 13 Mecca Double Folders. Notwithstanding the ample supply of Old Judge cards, the book primarily is filled with T205 and T206 cards, sorted by advertising back and then alphabetically by player. As I alluded to above, the T205 cards were cataloged by cigarette advertisement along with the T206 cards, commingled alphabetically by player when they shared the common Sweet Caporal advertising back. The book shows evidence of its age, repeated use, and, unfortunately, moderate abuse. The remnants of a contemplated theft are found on the page containing Soveriegn-backed T206 cards of Ty Cobb -- a T206 Cobb (bat off variation) is missing a good portion of its upper half, likely having been torn by an unscrupulous attempted thief. But, by and large, most of the cards were well preserved by the paste that held them fast to each page. Goulston’s T206 collection contains 456 total cards (out of a possible 524 different front variations). The advertising backs are broken down as follows: 410 Sweet Caporal; 26 Piedmont; 13 Sovereign; 5 El Principe De Gales; 1 Polar Bear and 1 American Beauty. The scarcity of the backs is somewhat as would be expected in a normal distribution of randomly collected T206 cards. The most common advertising backs, Sweet Caporal and Piedmont, are most heavily represented in Goulston’s collection. That Sovereign is a little tougher is reflected in the fact that Goulston had just 13 examples. And while Polar Bear is not quite as tough to find today, it was sold as scrap tobacco, so whoever bought most of the cards that make up Goulston’s collection was apparently not a fan of scrap tobacco. Finally, El Principe De Gales and American Beauty backs are somewhat rarer. Accordingly, one would not expect to see, and Goulston did not have many, of these in his collection. It should be noted that Goulston’s collection did not have any of the most rare backs, such as Drum, Uzit, Carolina Brights, Broadleaf, etc. Because Piedmont cigarettes were popular in the Southeast, while Sweet Caporal brand was favored in the Northeast, the overwhelming number of Sweet Caporal cards suggests that this collection was created in the Northeast -- not at all surprising given that Goulston worked in Boston for the Braves. It is probably for this reason that none of the 48 Southern Leaguers are part of Goulston’s collection. In short, Goulston put together a fairly accessible set of T206 cards, without managing to get many of the tougher-to-find cards, again, except for the most sought after of them all -- Honus Wagner. I found it somewhat surprising that Goulston had the toughest card, but failed to acquire any of these cards. I suspect that Goulston specifically sought to acquire his Wagner, but that he either did not know of or did not care to try to amass the others listed above. Goulston may not have known that there were two different Dunns or Bridwells, and he may not have been aware of Beckley or Hannifan, but it is still surprising that Goulston apparently missed these 9 cards in his collection since they are not particularly hard to find today. Leopold Goulston put together a fine collection of T206 cards during an era in which it was much more difficult to do so. And, given the date of the donation, Goulston’s near set may be the oldest and largest intact collection of T206 cards in existence. Indeed, Jefferson Burdick’s massive card collection was not donated to the Metropolitan Musuem of Art until 1963, which gave him 17 years more than Goulston to piece together his collection -- though, it is possible, if not likely, that Burdick finished his T206 collection well prior to 1946. Goulston was able to acquire every Hall of Famer, except Beckley (surprising) and Plank (not surprising). Of course, had Goulston collected T206 cards today, he would easily be able to knock the 9 missing common cards off his list within a few days spent at his computer on eBay, or perhaps in a few short hours at a relatively modest baseball card show. (In fact, I recently acquired these 9 cards -- a low-grade mini-set of the missing Goulston common cards, which I donated to the library on June 18, 2008.) The Southern Leaguers and the rarities would have continued to give him trouble, as they do so many collectors today. While not every aspiring collector of T206 cards will be able to visit the Goulston Collection, I certainly encourage any candidate with research ambitions to apply for access. Being able to review such a significant collection, in the manner it was preserved over 60 years ago, is a unique hobby experience. Below is an e-mail I received from Ms. Bartow as a result of the research I conducted on Goulston’s T206 Collection. I am overwhelmed by your kindness. Truly. card collection. It will go directly into the file. readers were simply unable to formulate a single question about the cards.